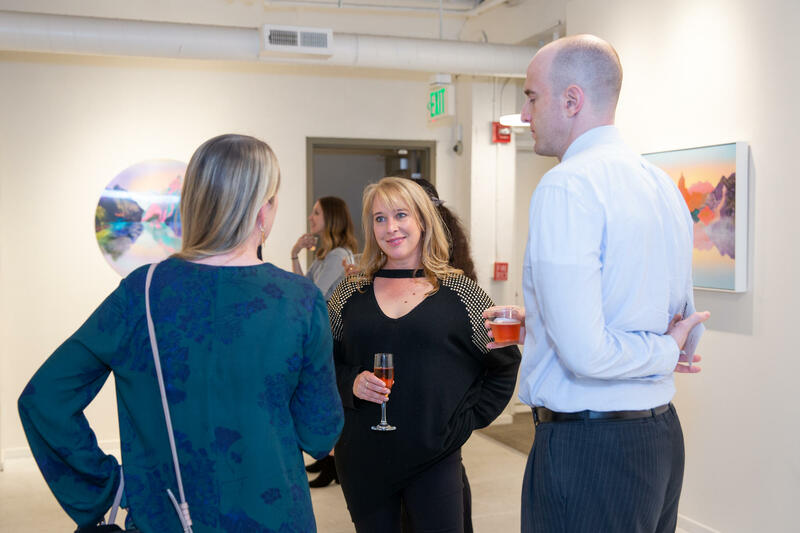 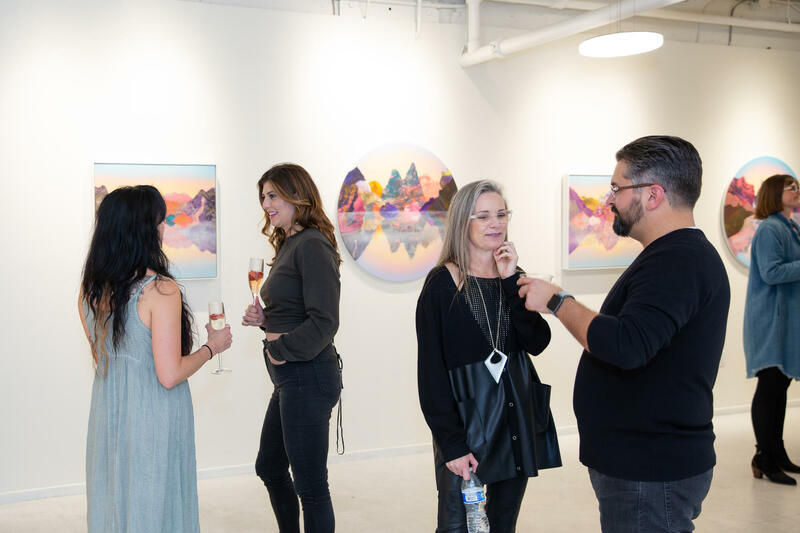 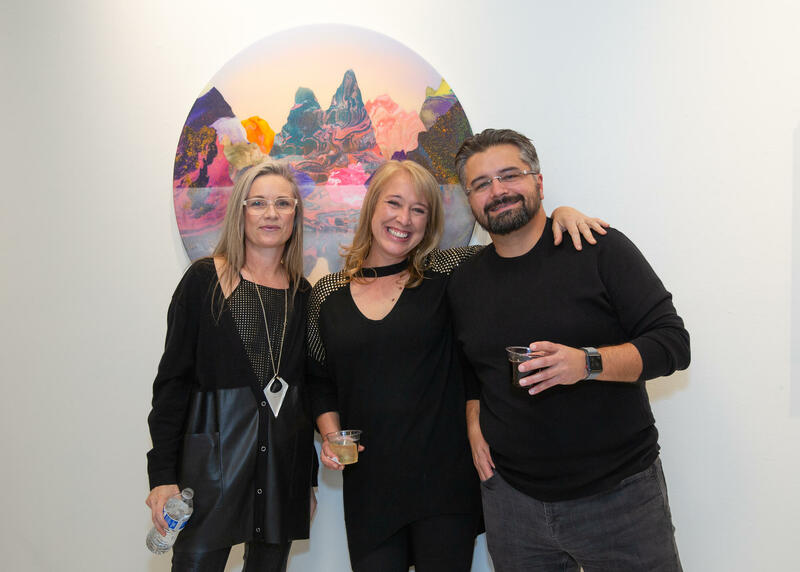 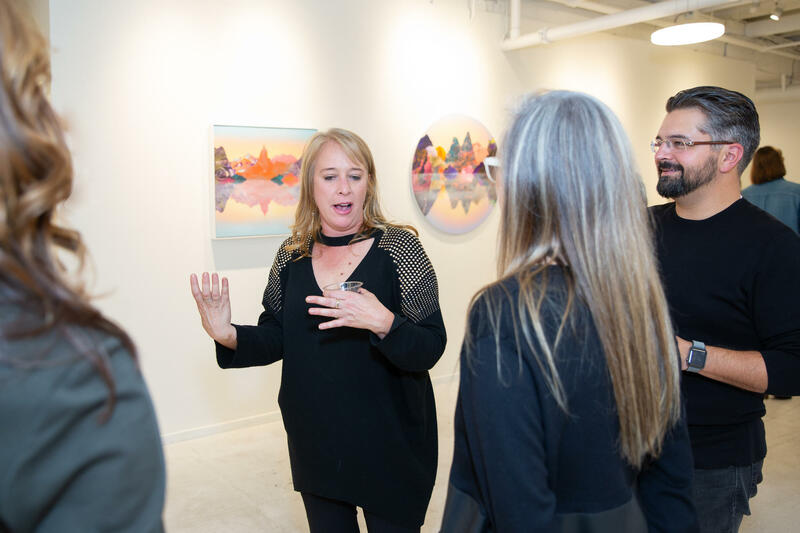 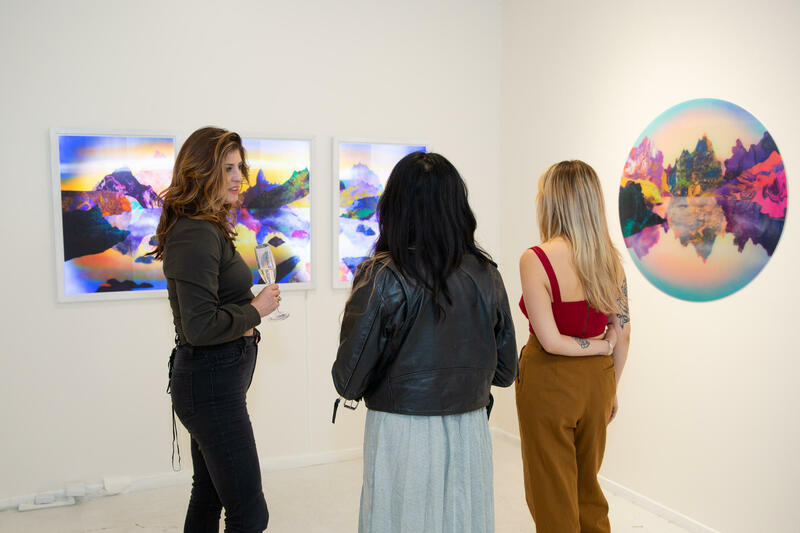 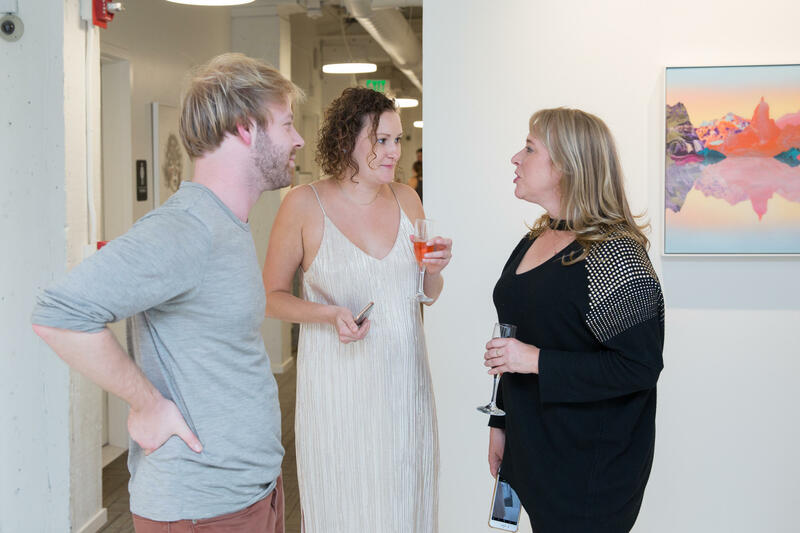 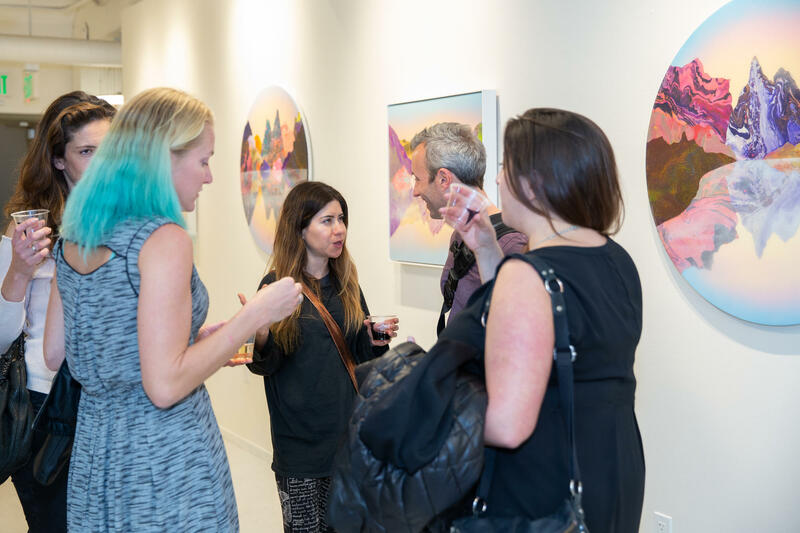 Mirus Gallery invites Kate Shaw back to San Francisco to exhibit her latest body of work “The Shadowlands,” opening October 12, 2018. 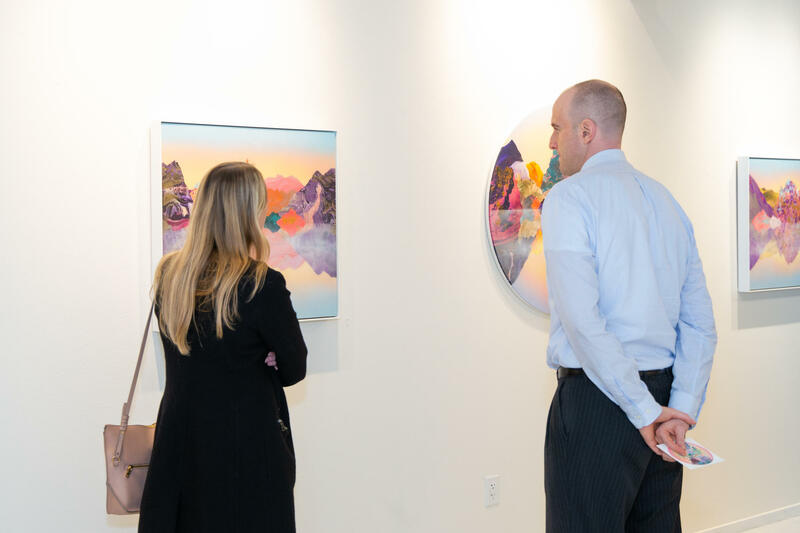 VIP & Press Preview from 6-7pm, followed by the General Public reception from 7-10. 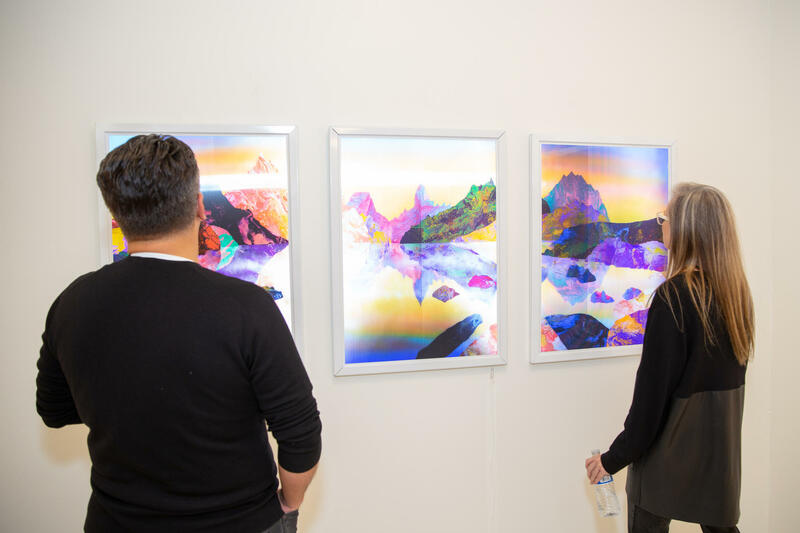 The exhibition is on display through November 3 and is FREE and open to the public. 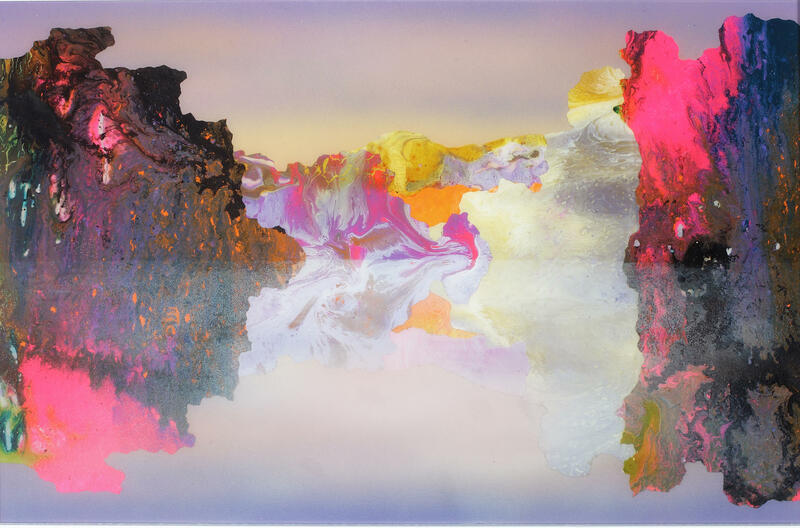 At first glance, the brilliant abstract landscapes of Kate Shaw possess a sublime, yet ephemeral quality. 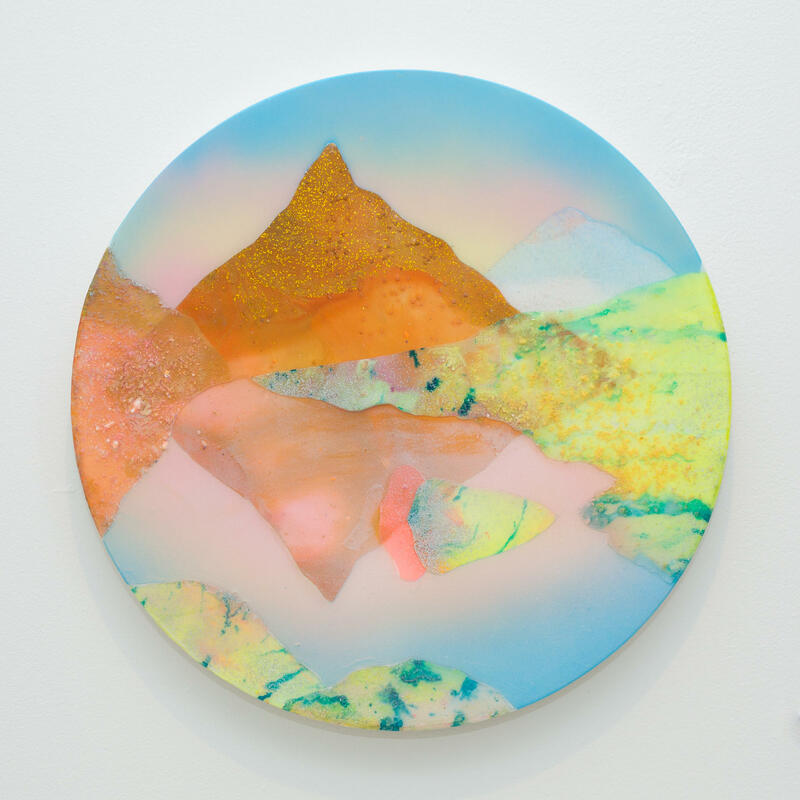 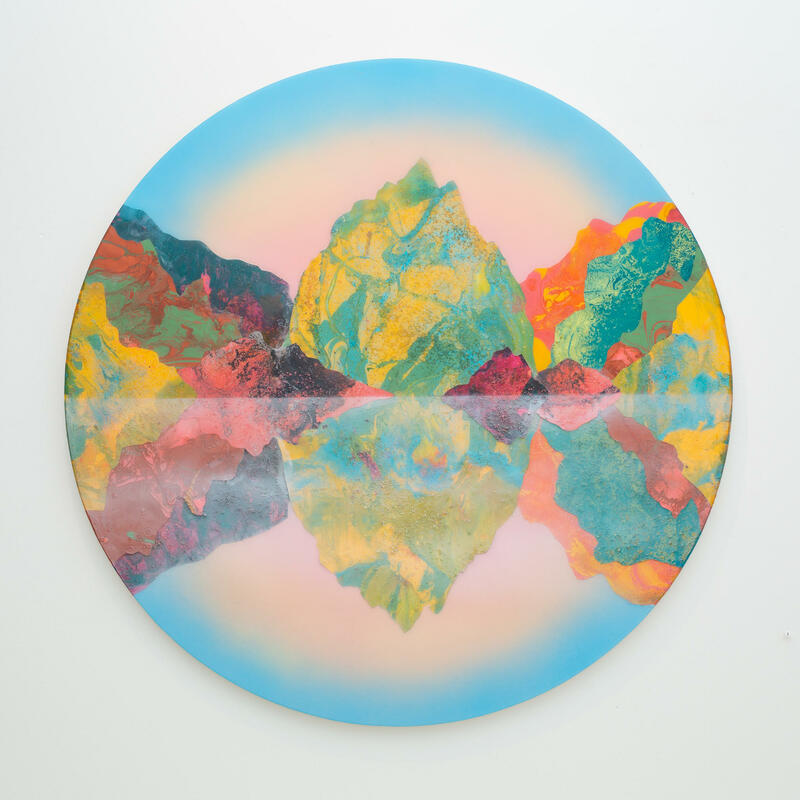 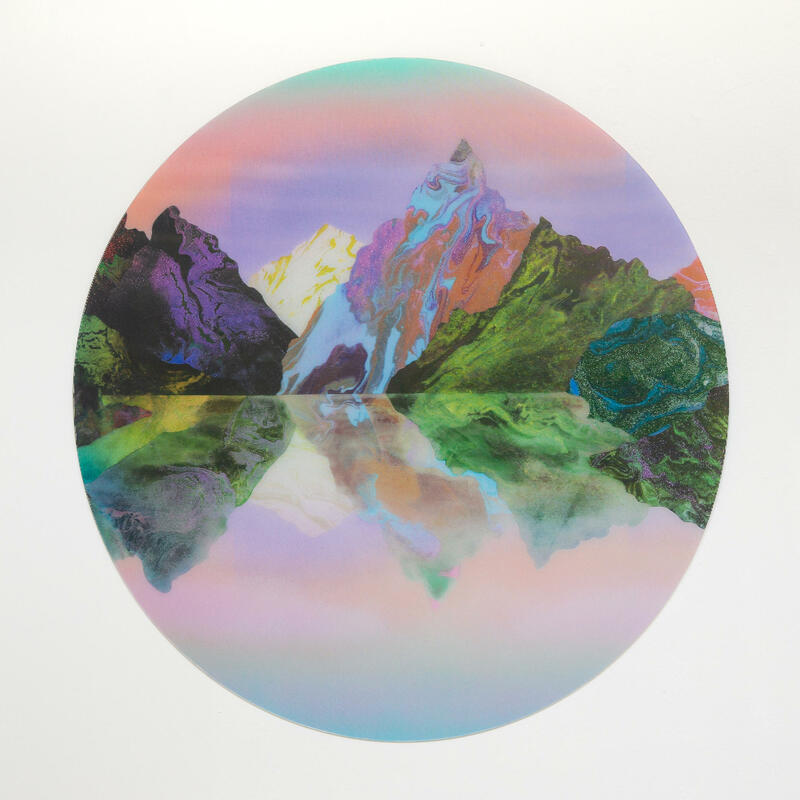 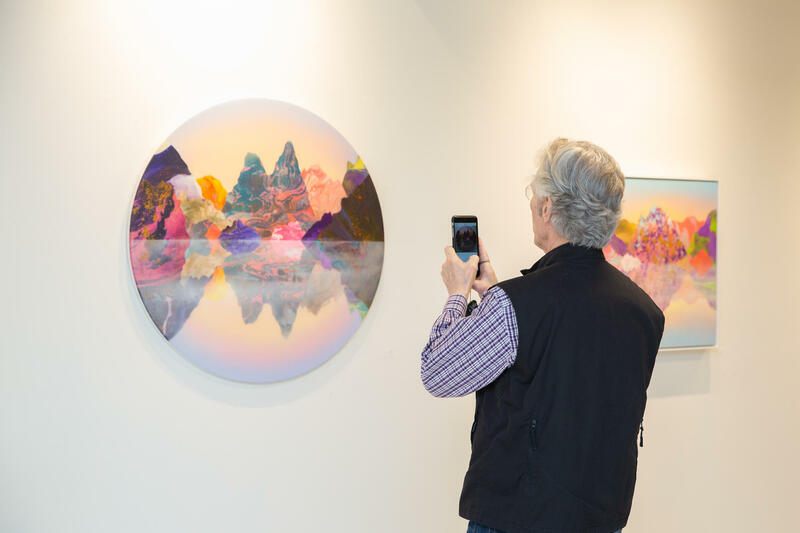 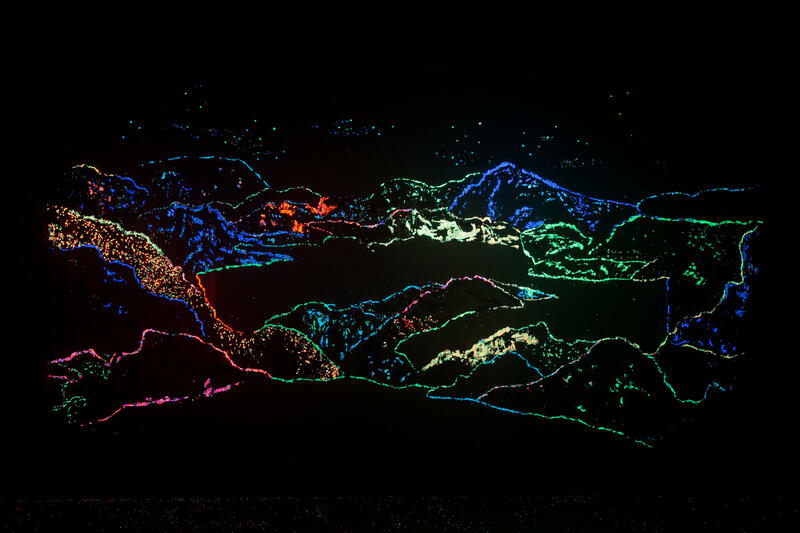 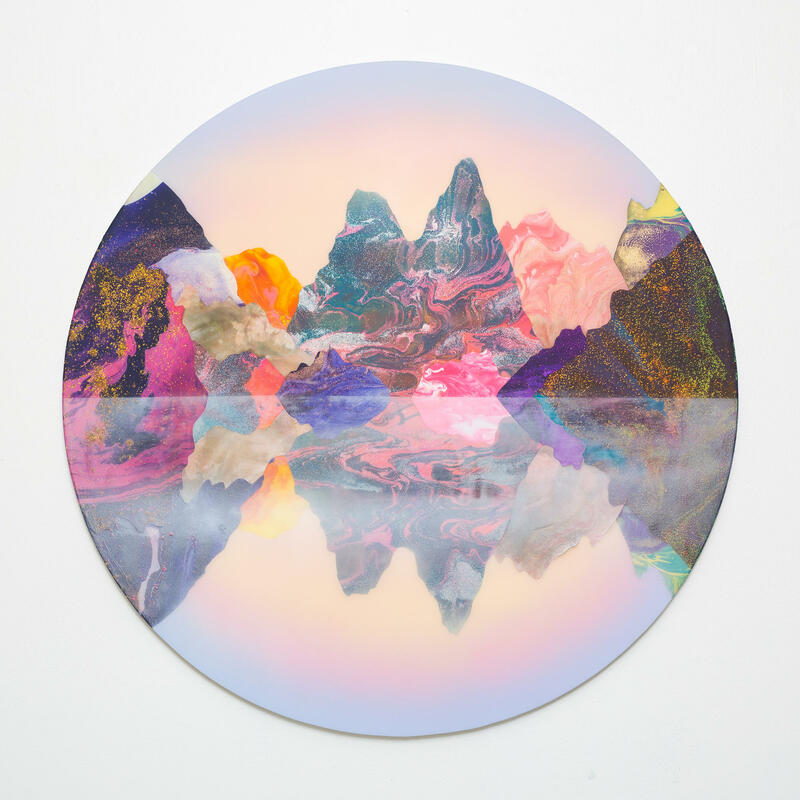 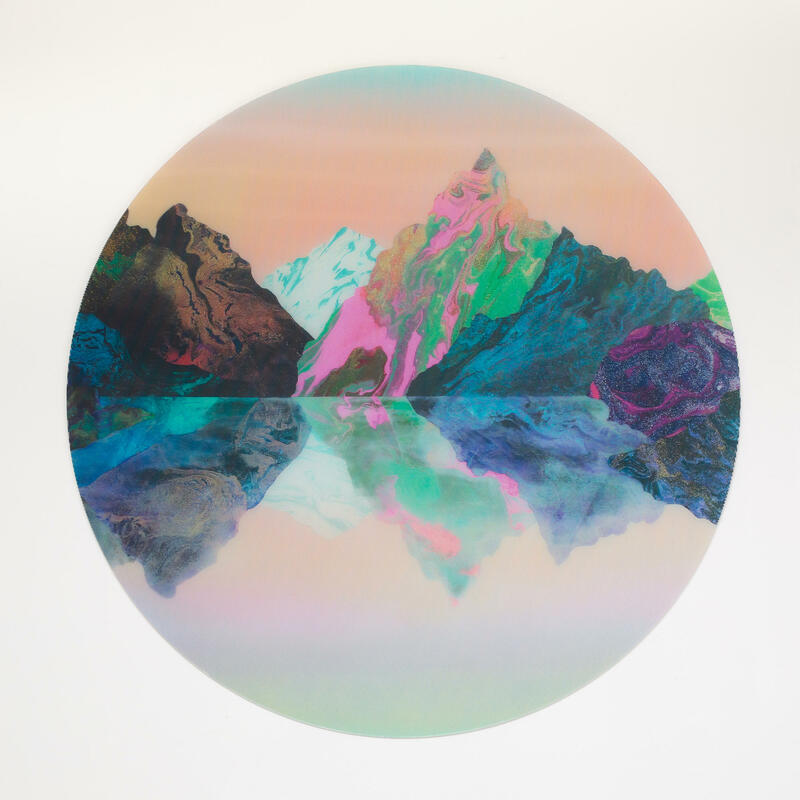 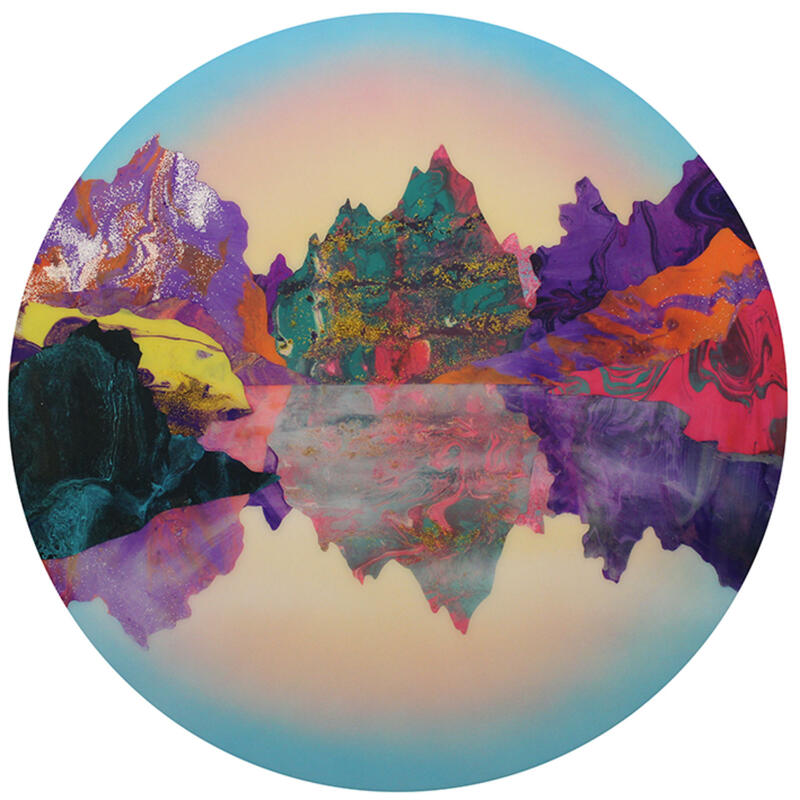 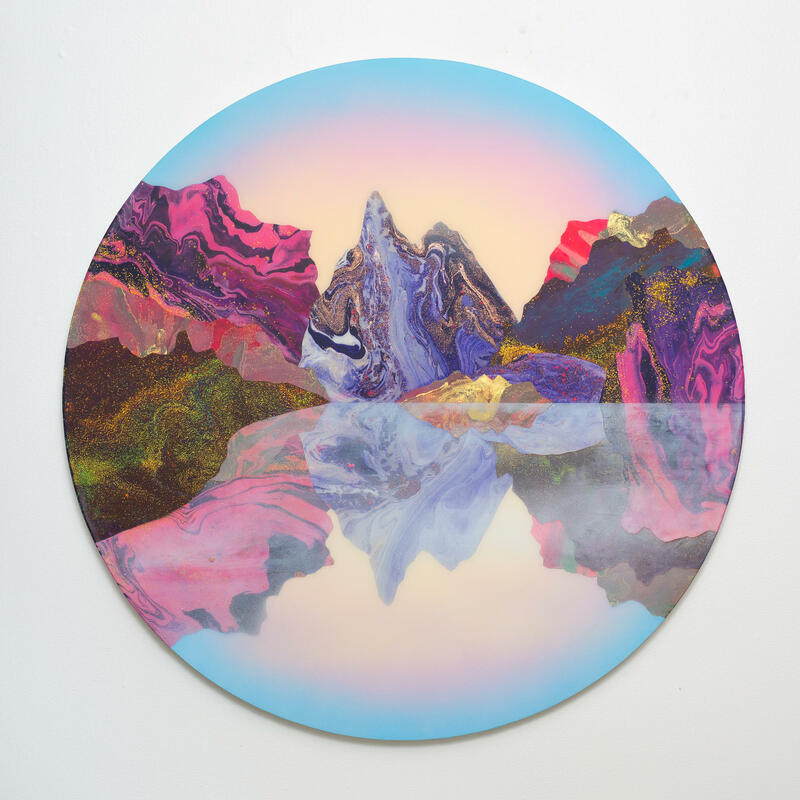 Mountains formed by pools of acrylic paint deliquesce into a reflective basin, creating a mirroring effect of the terrain above. 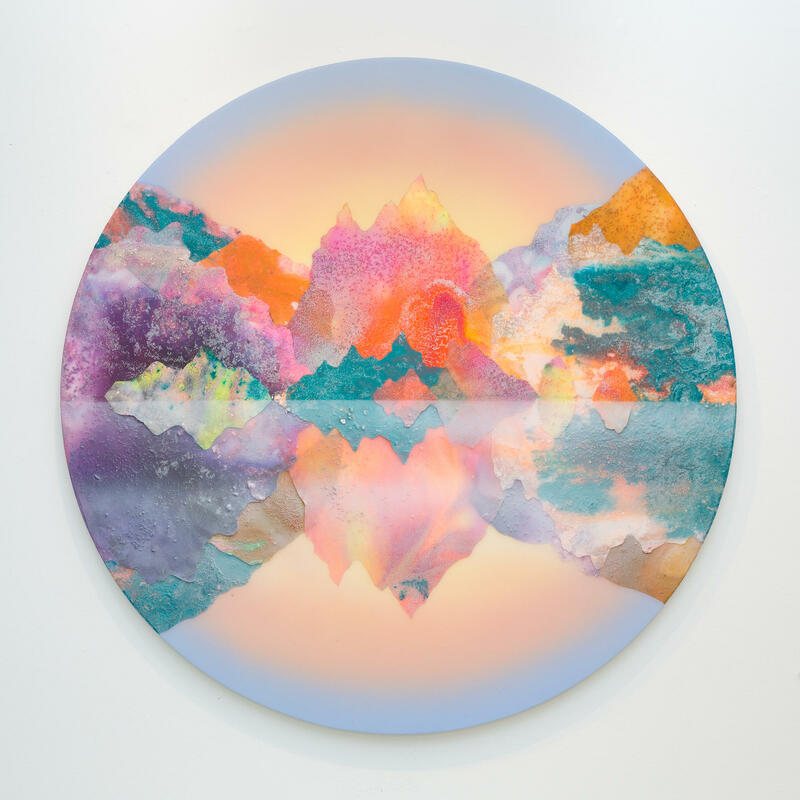 Her use of paints with vivid hues and iridescent qualities prove the landscapes to have an attractive and idealistic quality. 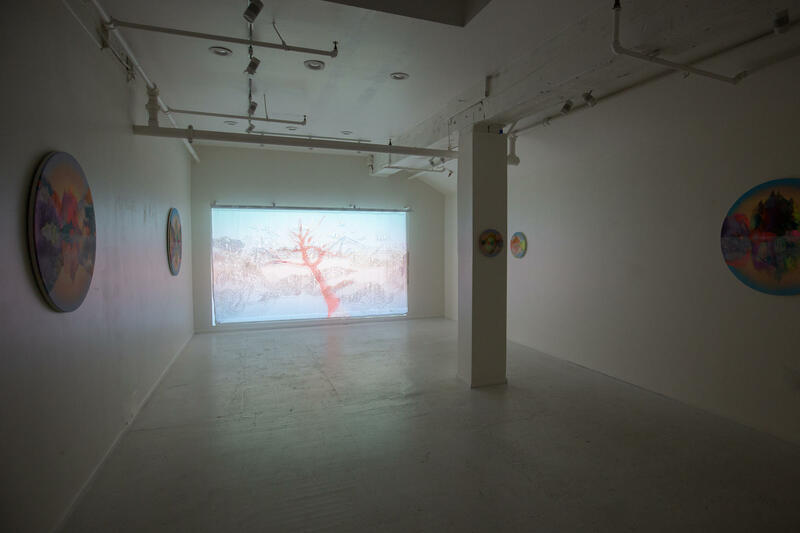 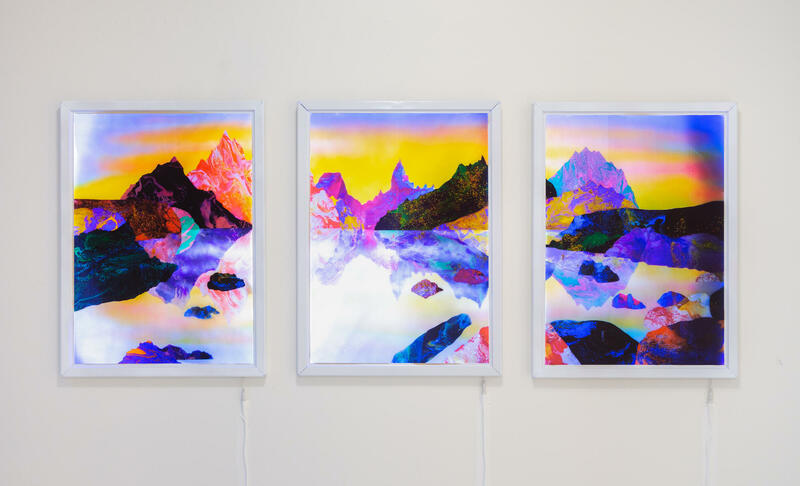 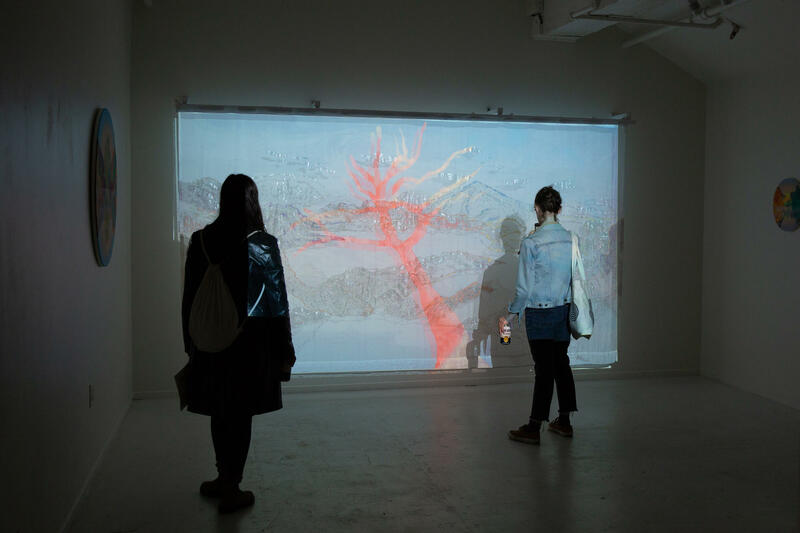 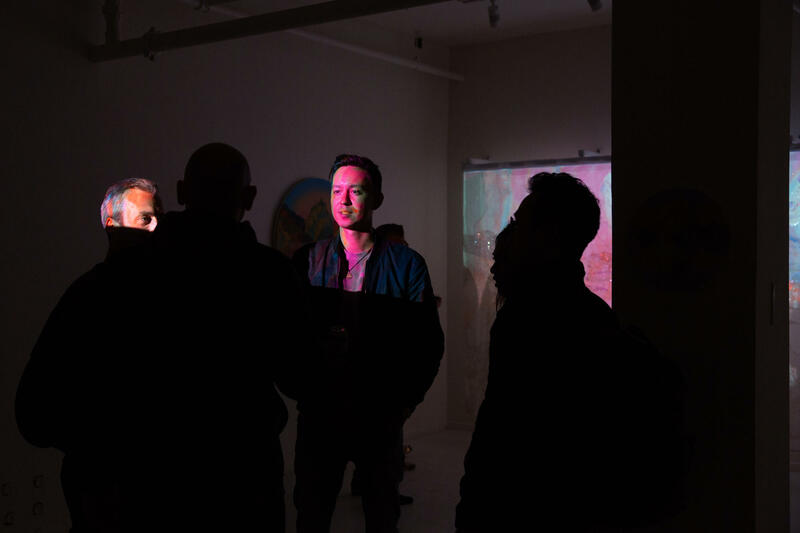 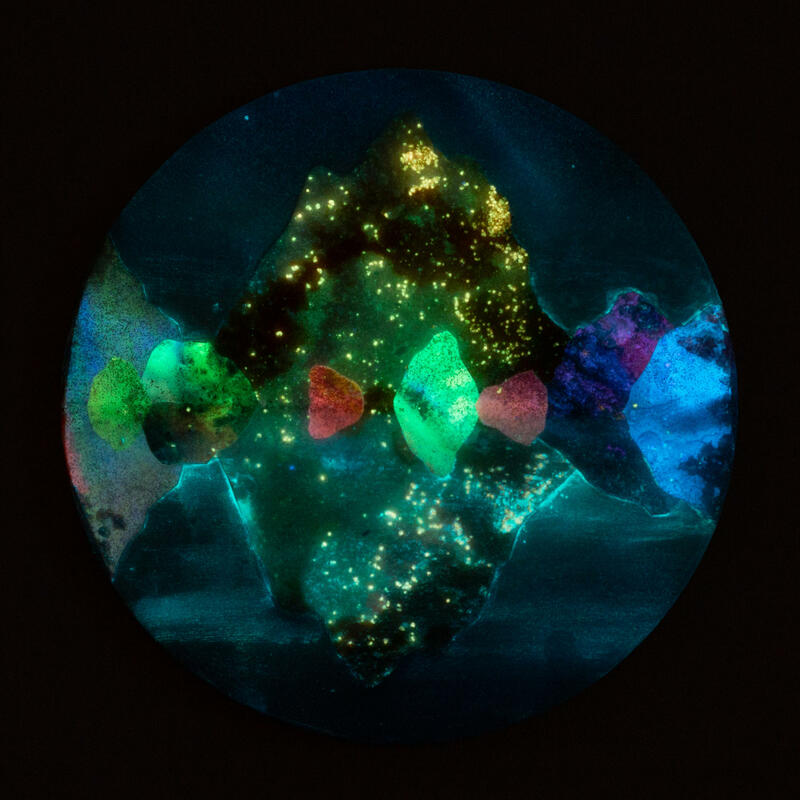 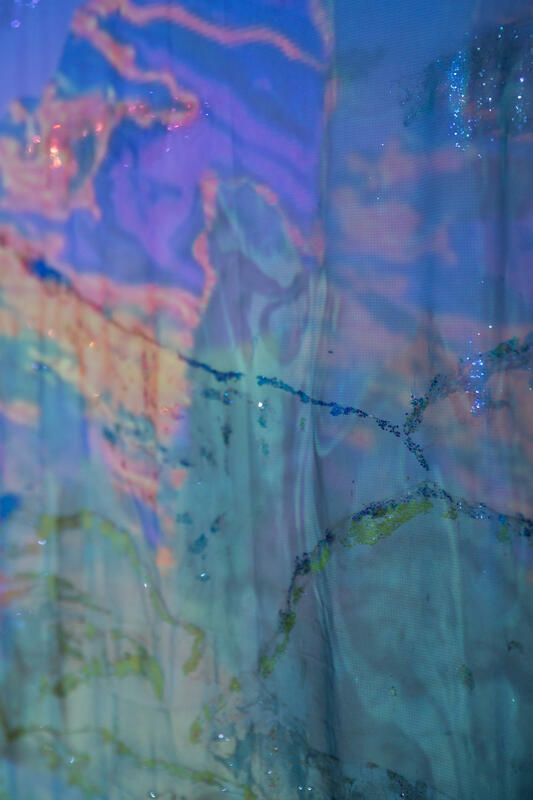 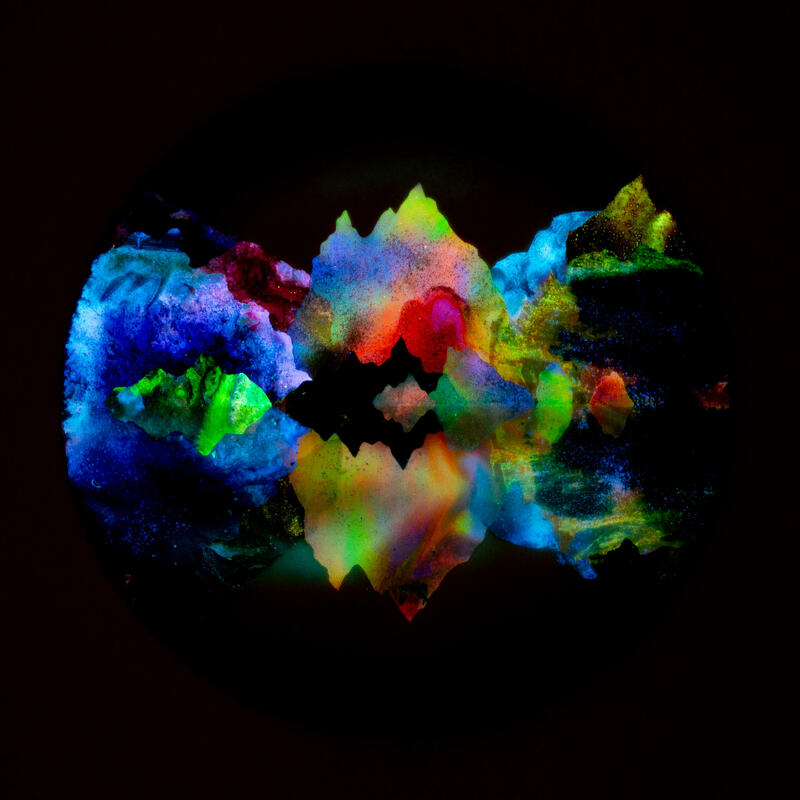 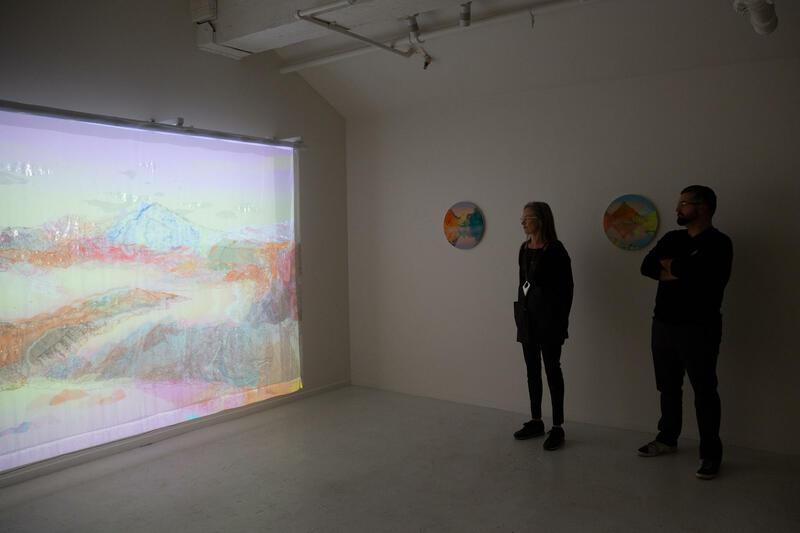 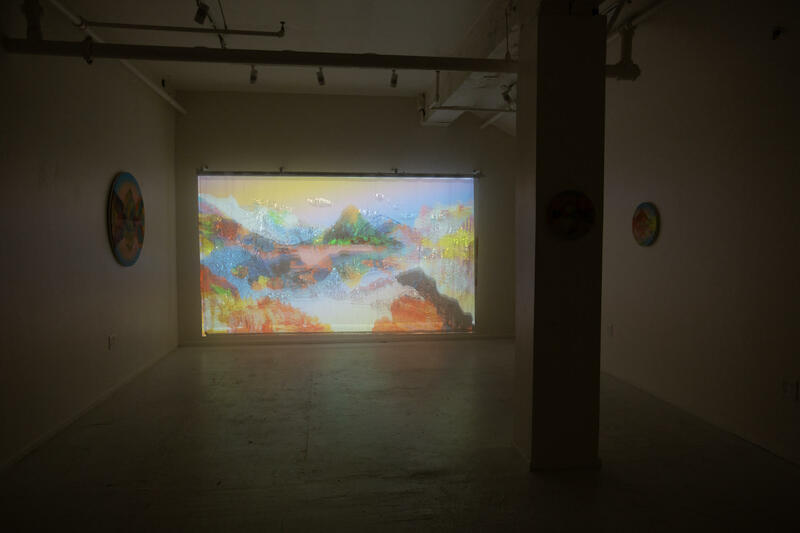 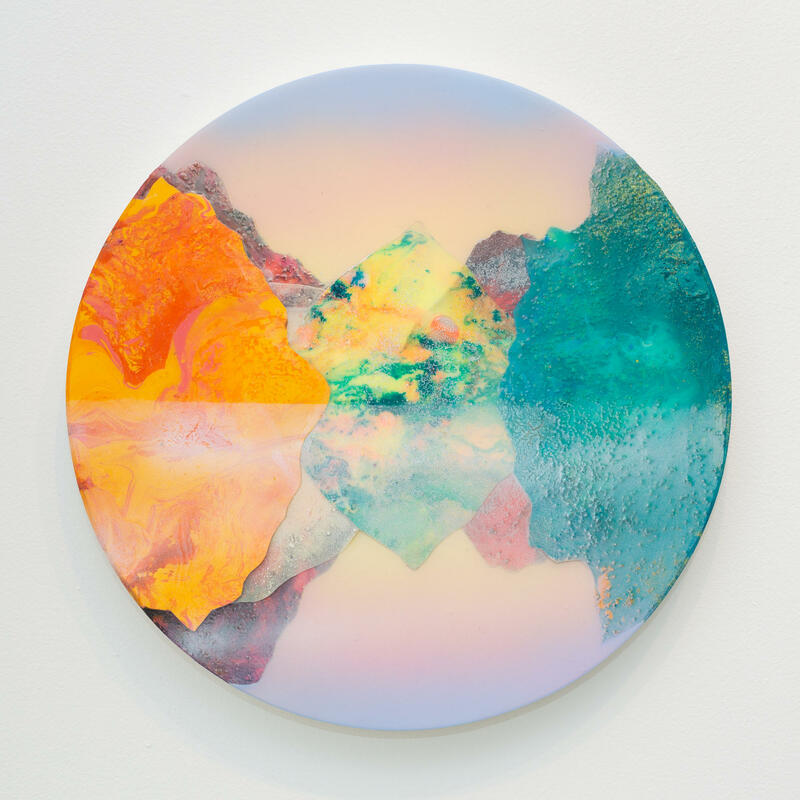 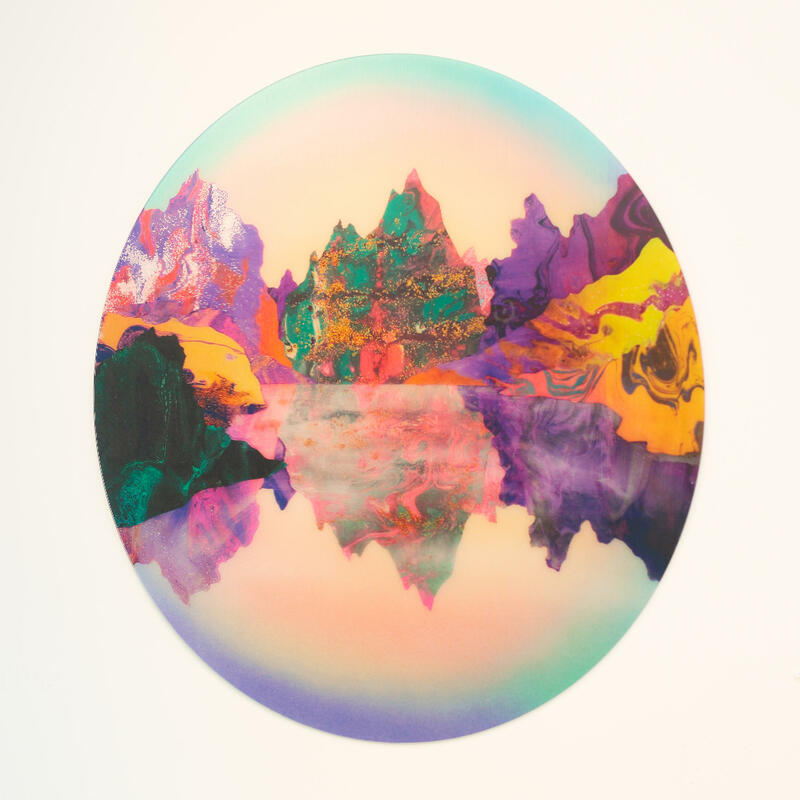 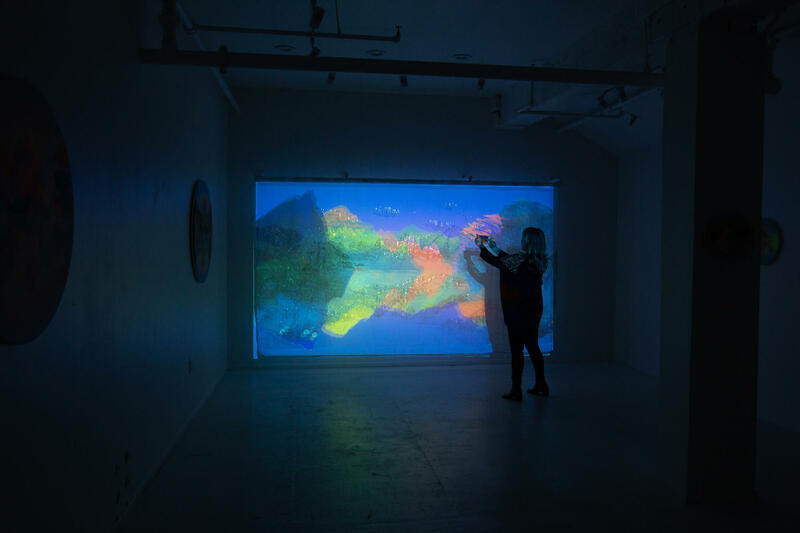 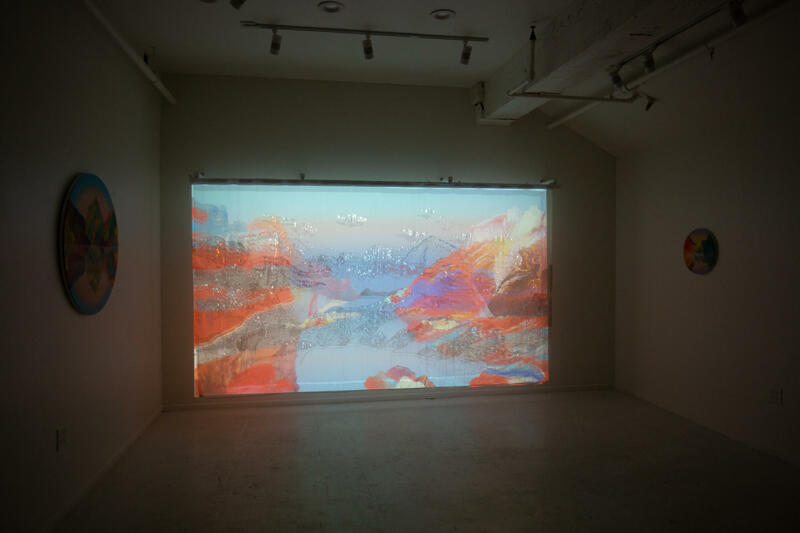 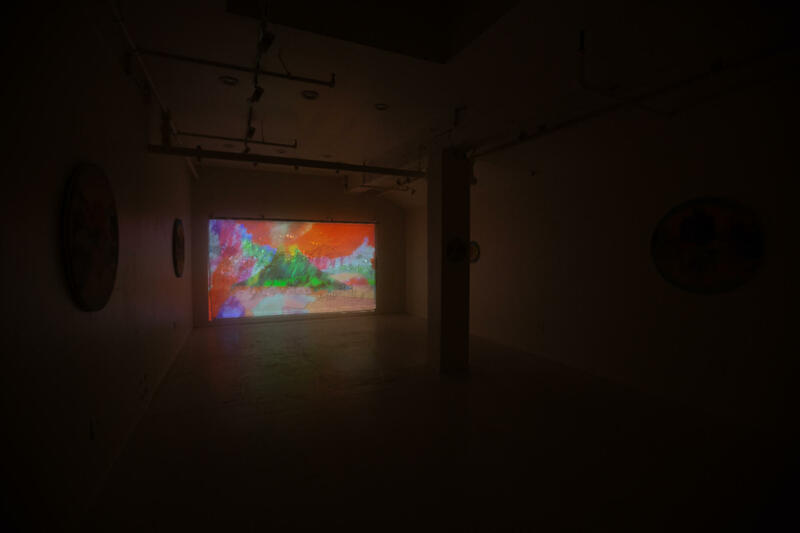 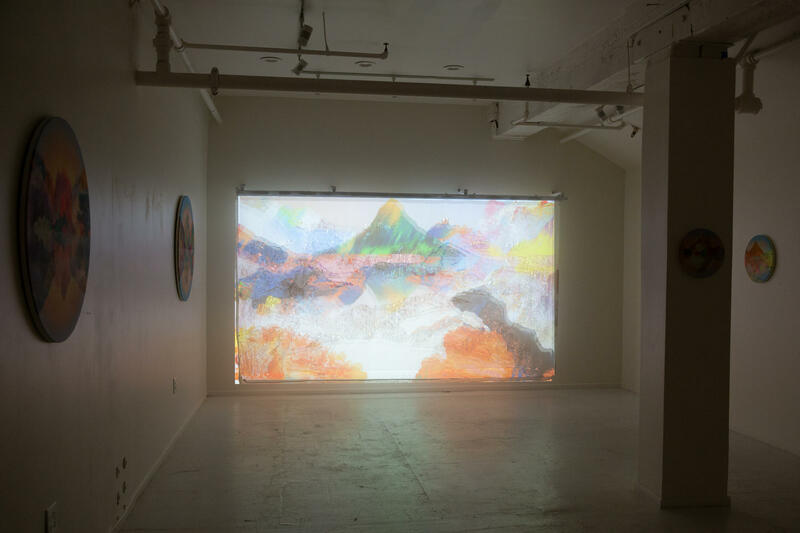 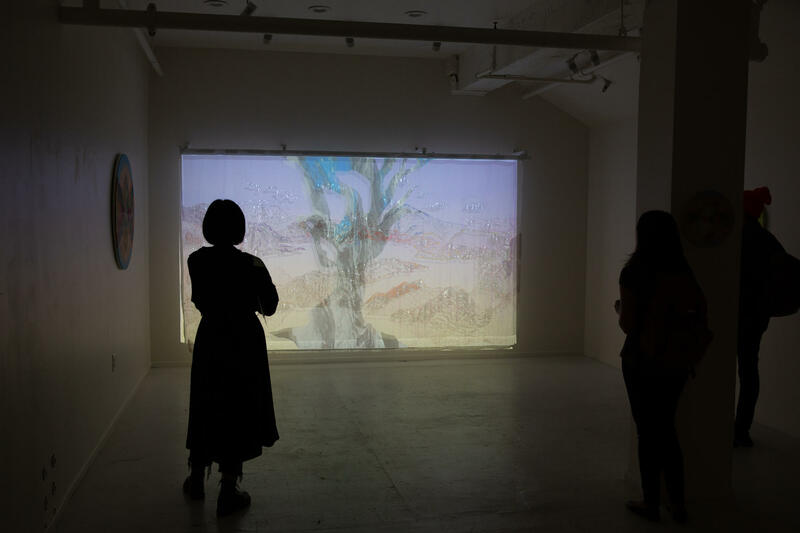 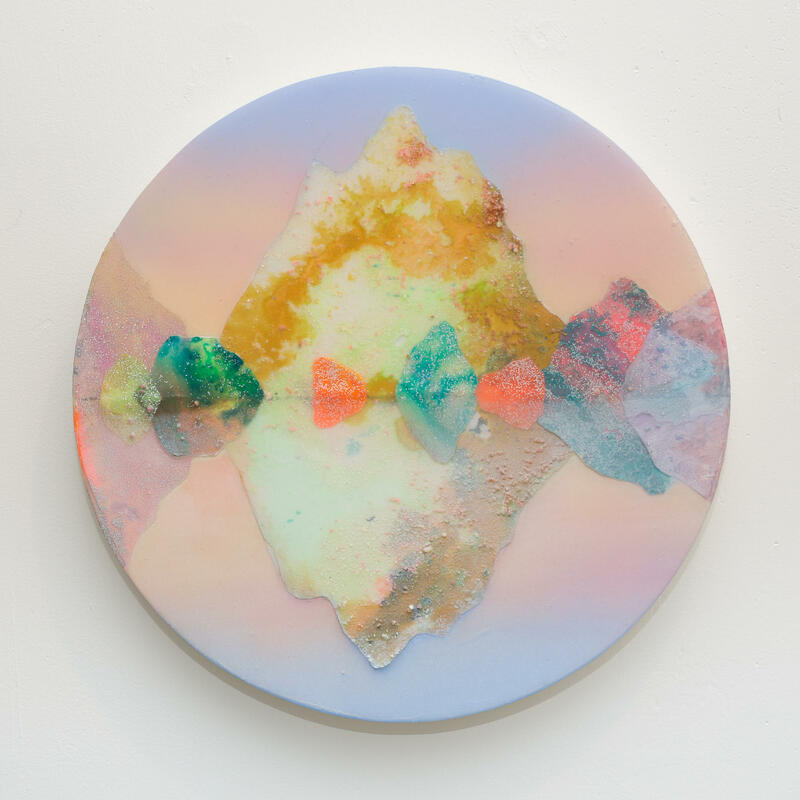 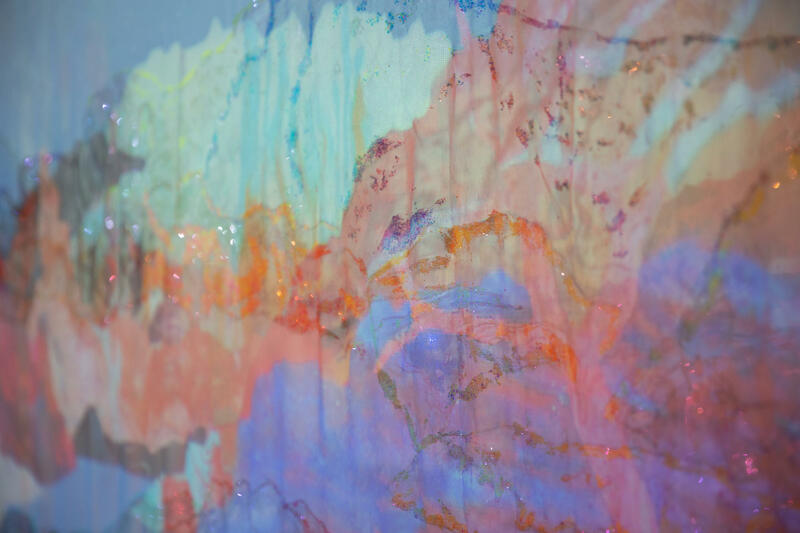 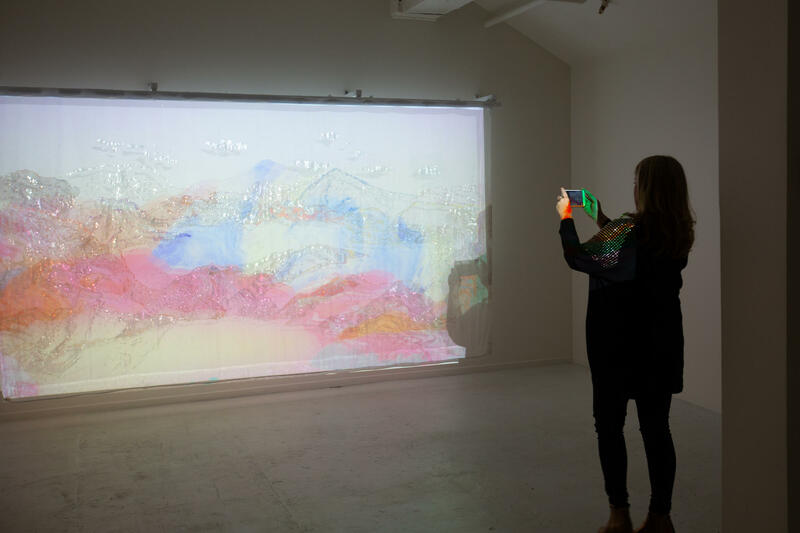 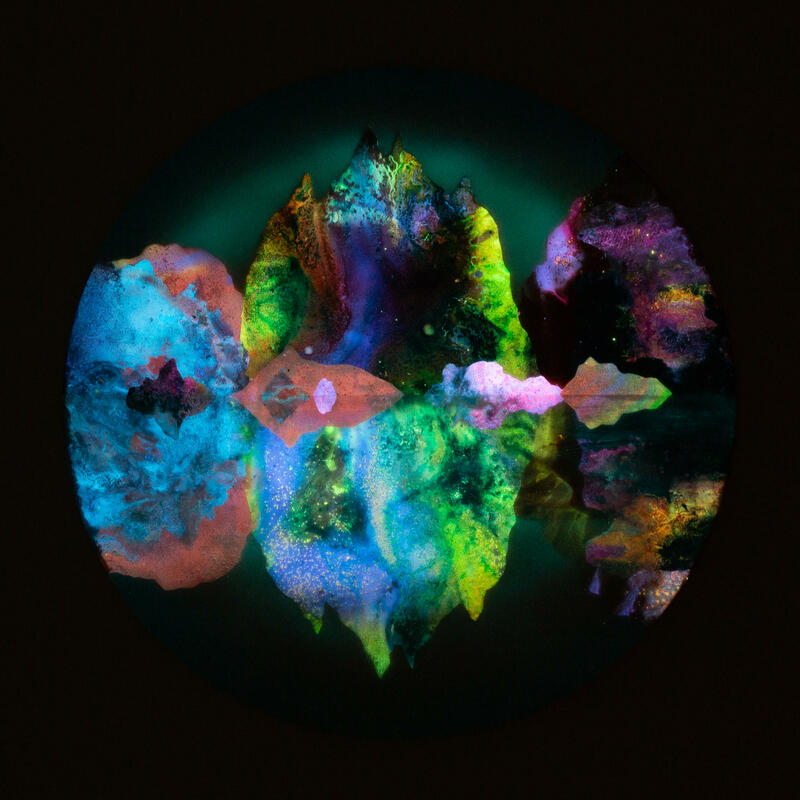 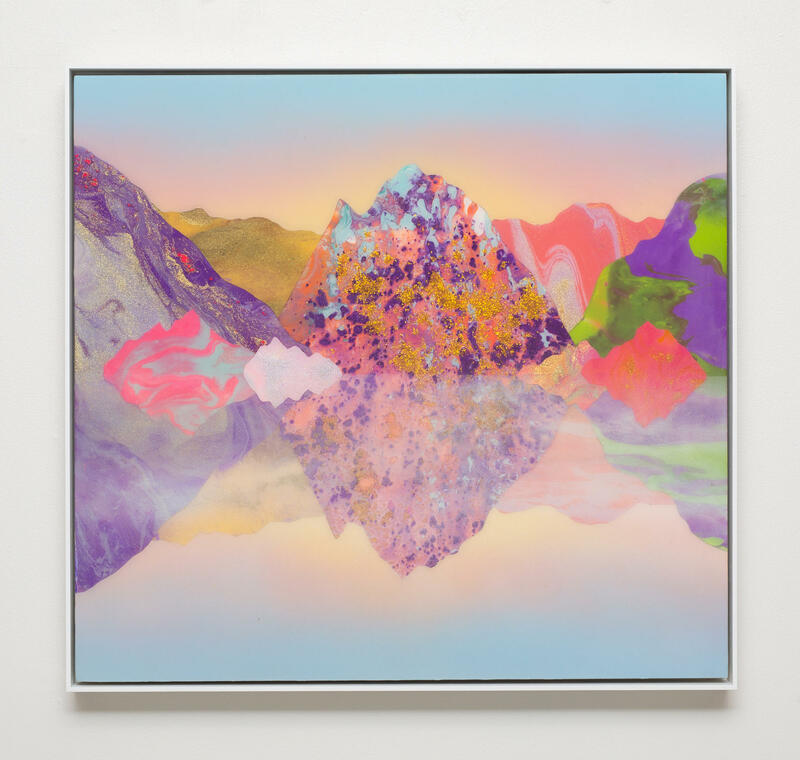 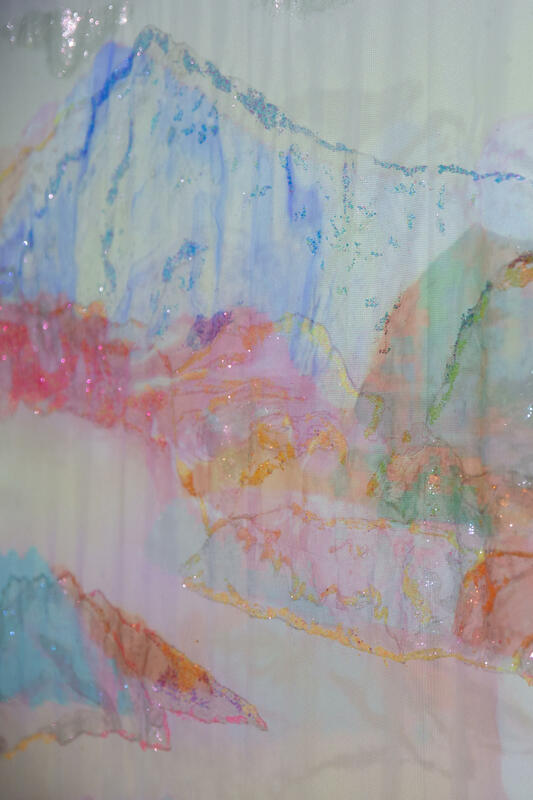 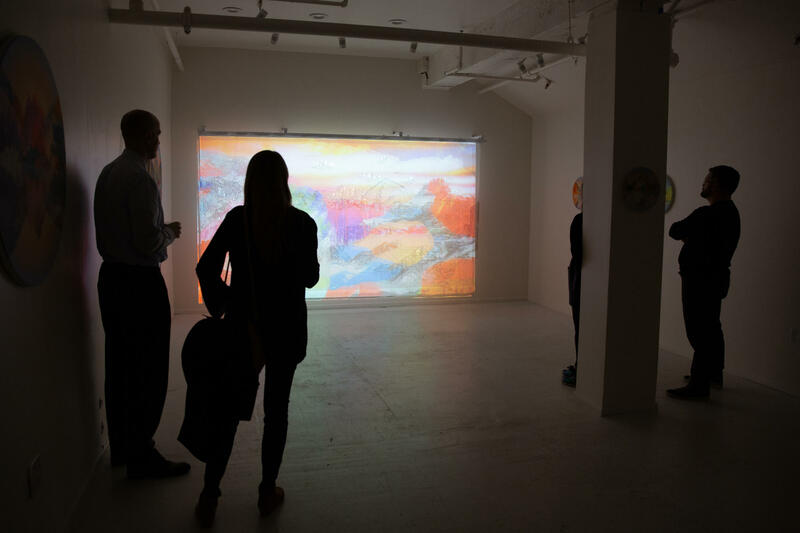 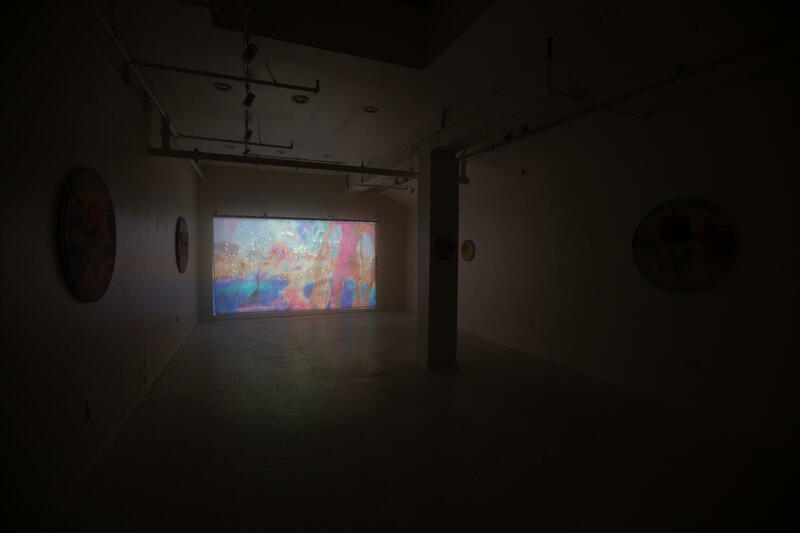 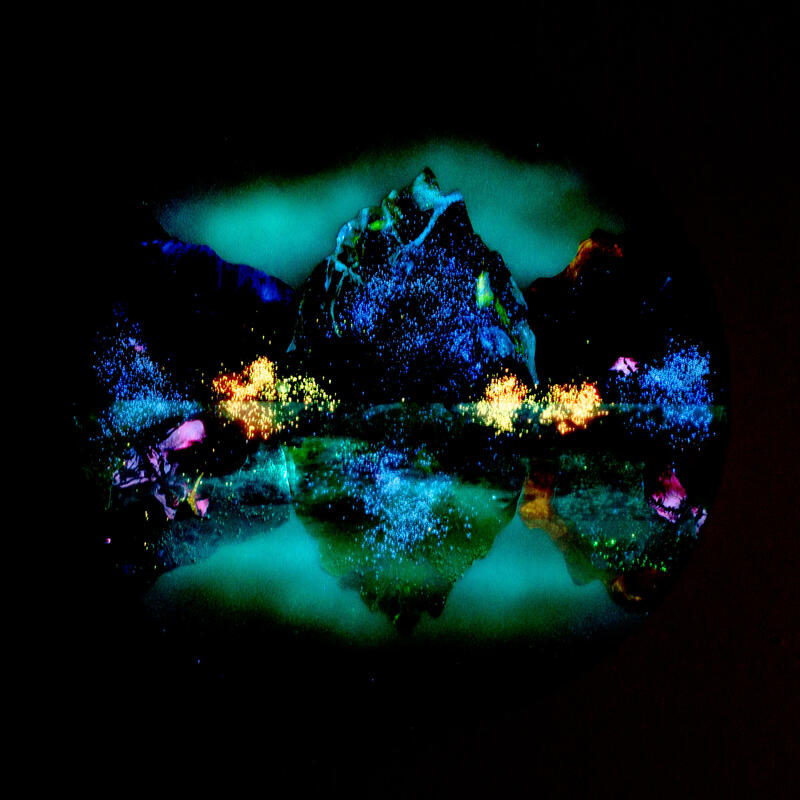 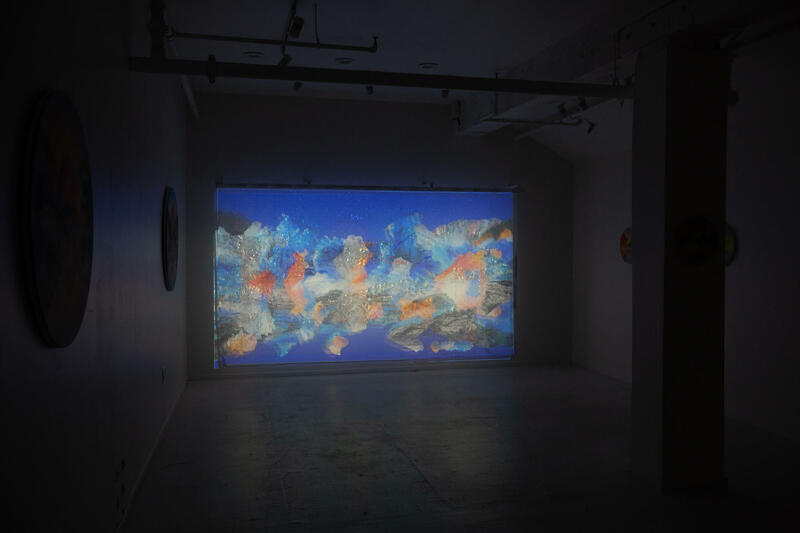 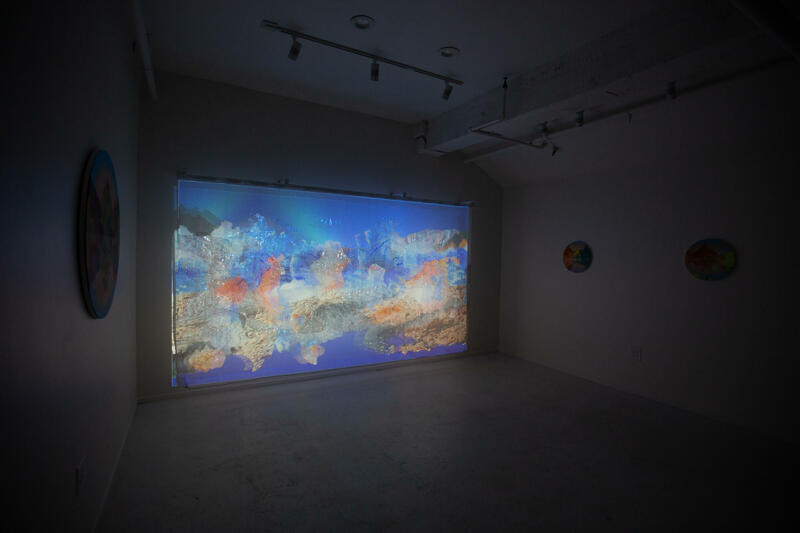 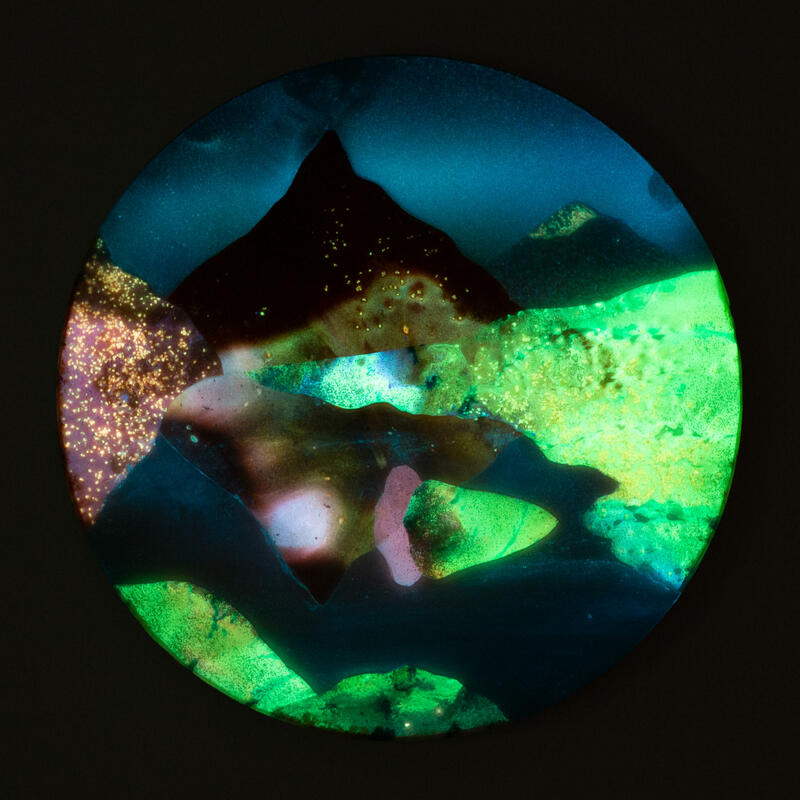 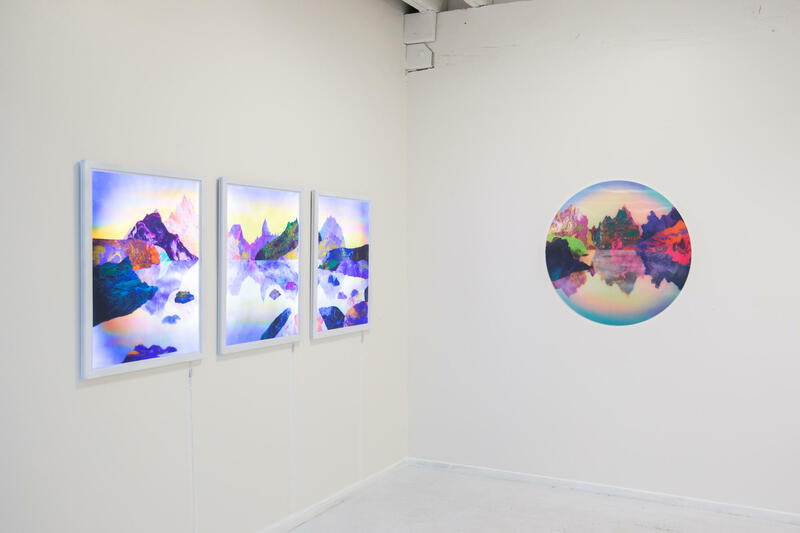 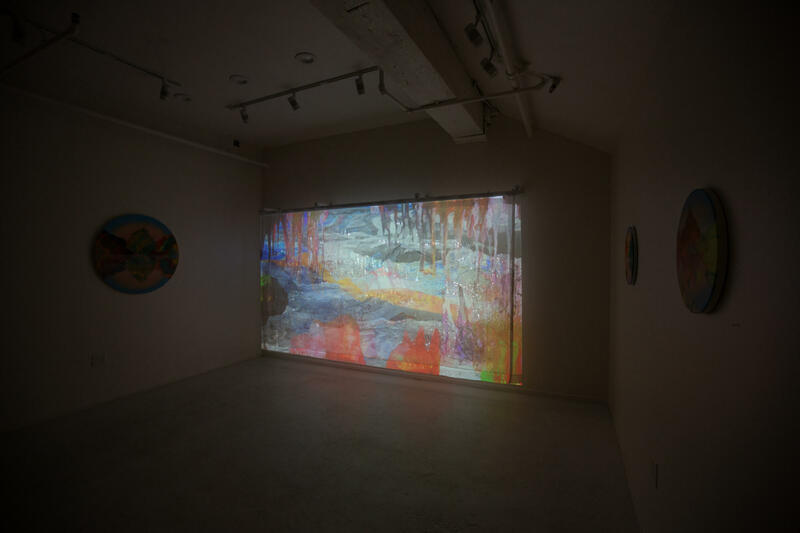 For this body of work, Kate Shaw has delves deeper into the physicality of darkness through the incorporation of phosphorescent paint, lenticular lightbox prints, and video projection. 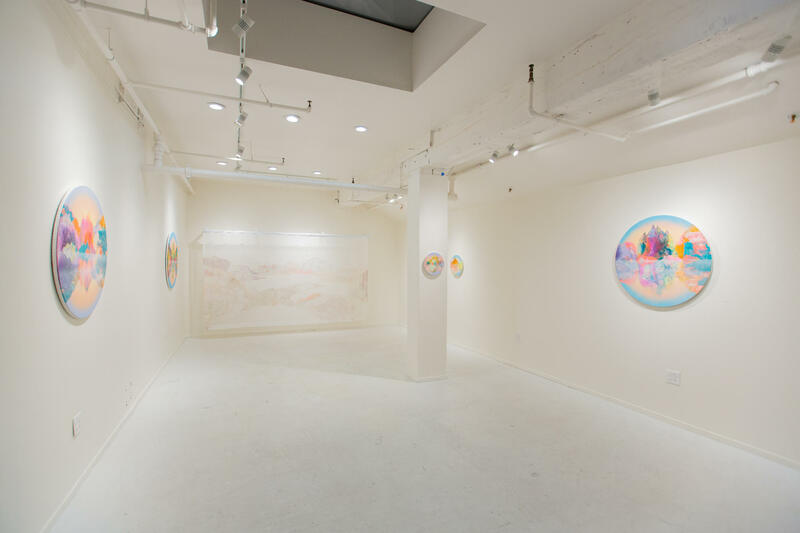 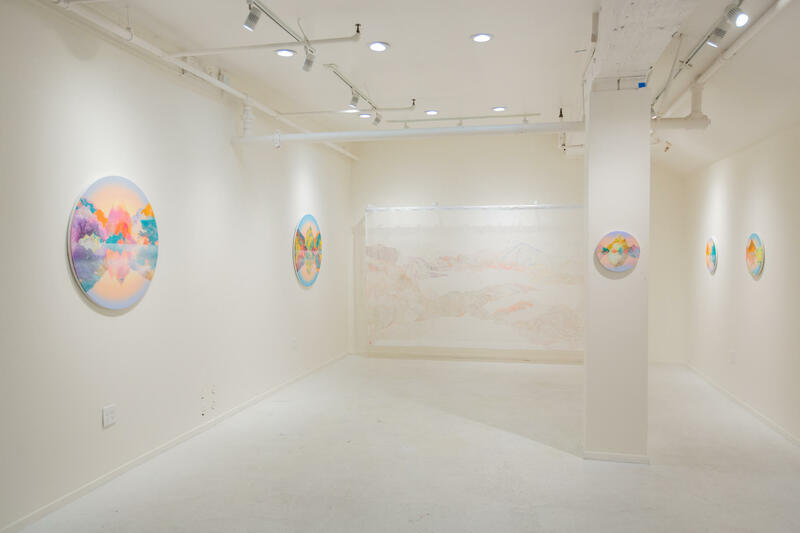 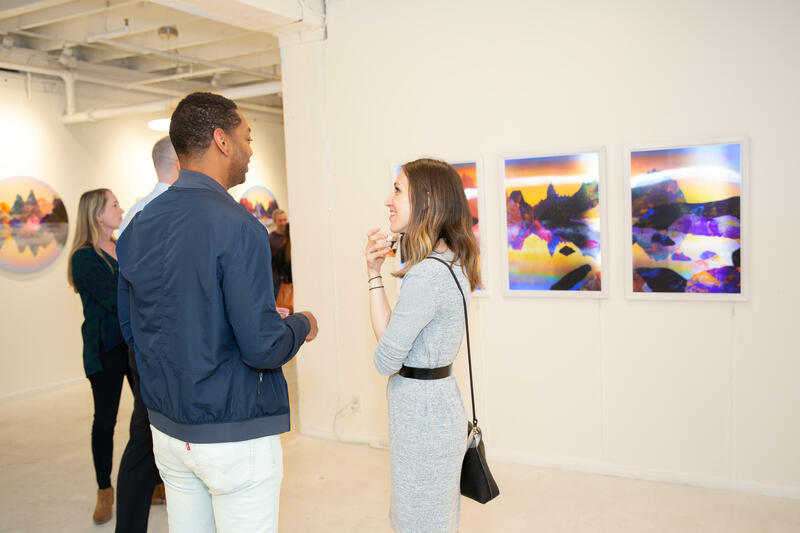 This is her second solo exhibition with Mirus Gallery in San Francisco. 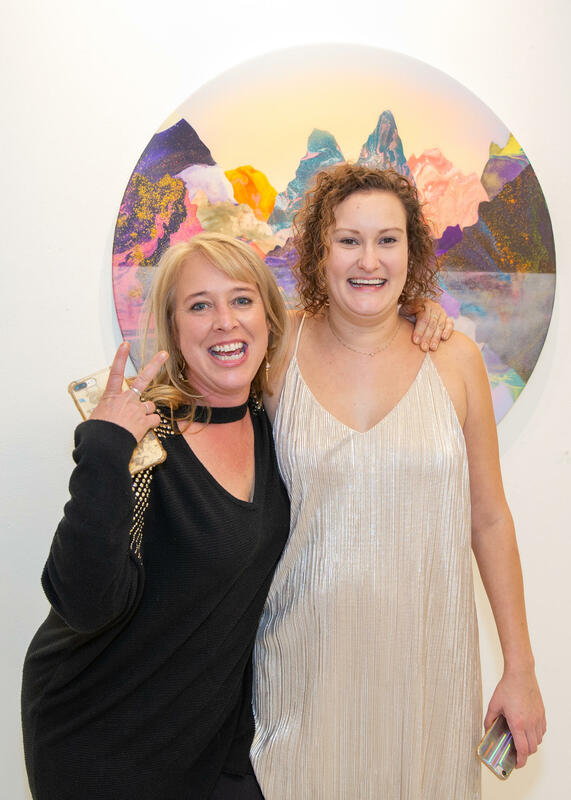 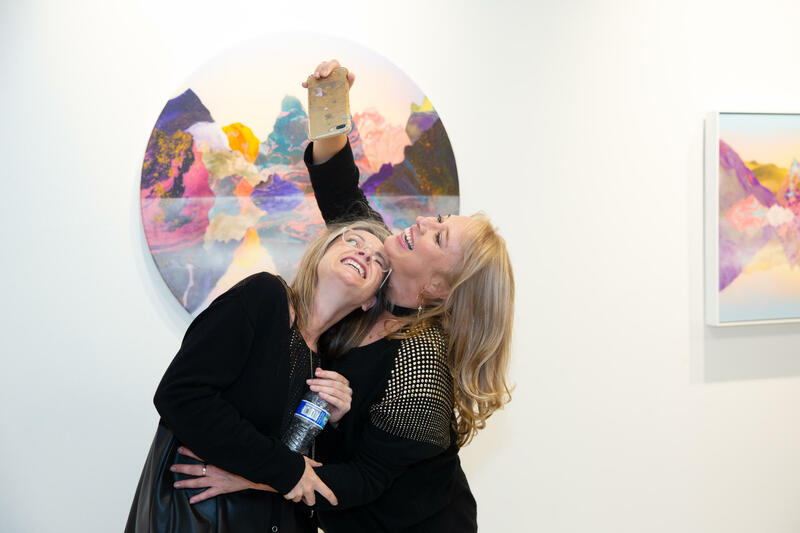 Kate Shaw is an award-winning Australian artist who spends her time working and living between Melbourne, London, Hong Kong and the US, having exhibited in Australia for 23 years and internationally for over 10 years. 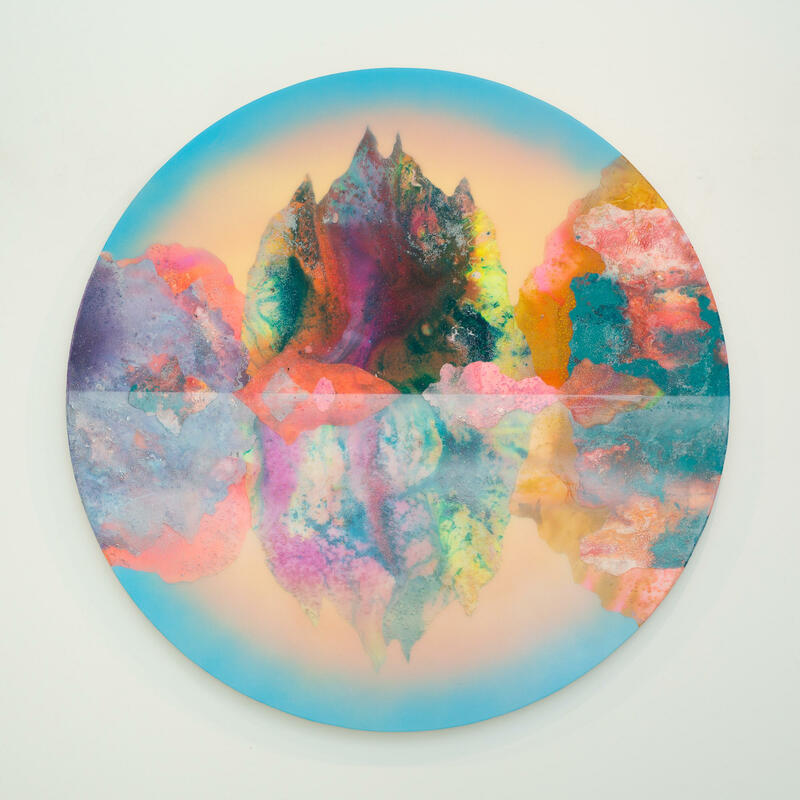 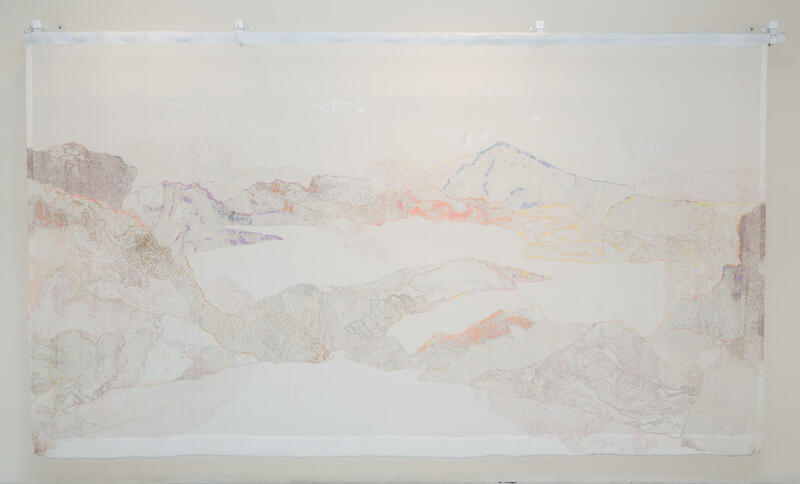 Her work reinterprets notions of what constitutes landscape painting, both within an art history context and a contemporary social context, reflecting upon the contradiction between our inherent connection to the natural world and continual distancing from it. 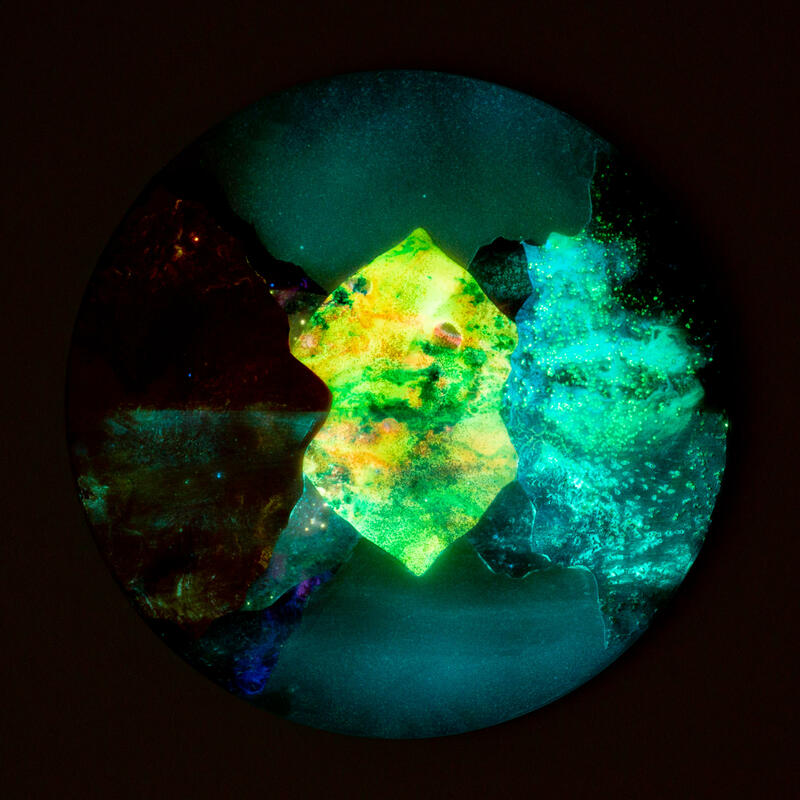 Prominent themes in Kate’s work include alchemy and environmental change. 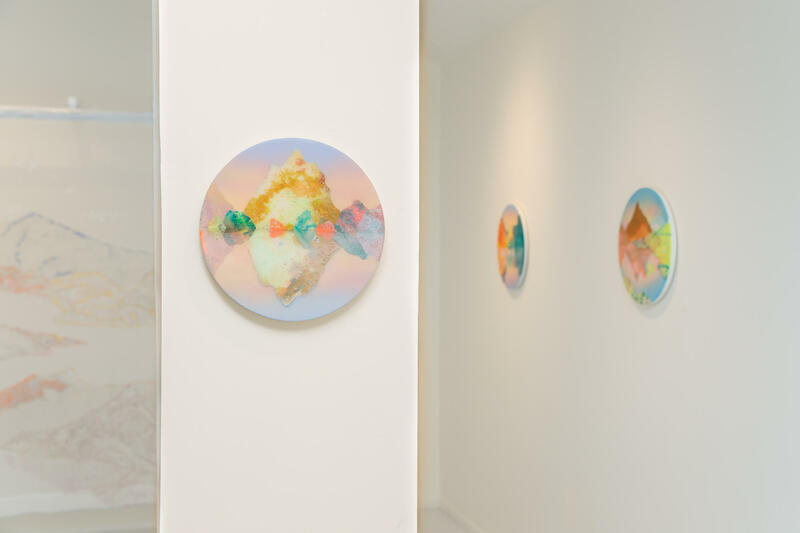 Kate has held solo exhibitions in New York, San Francisco, London Hong Kong and throughout Australia. 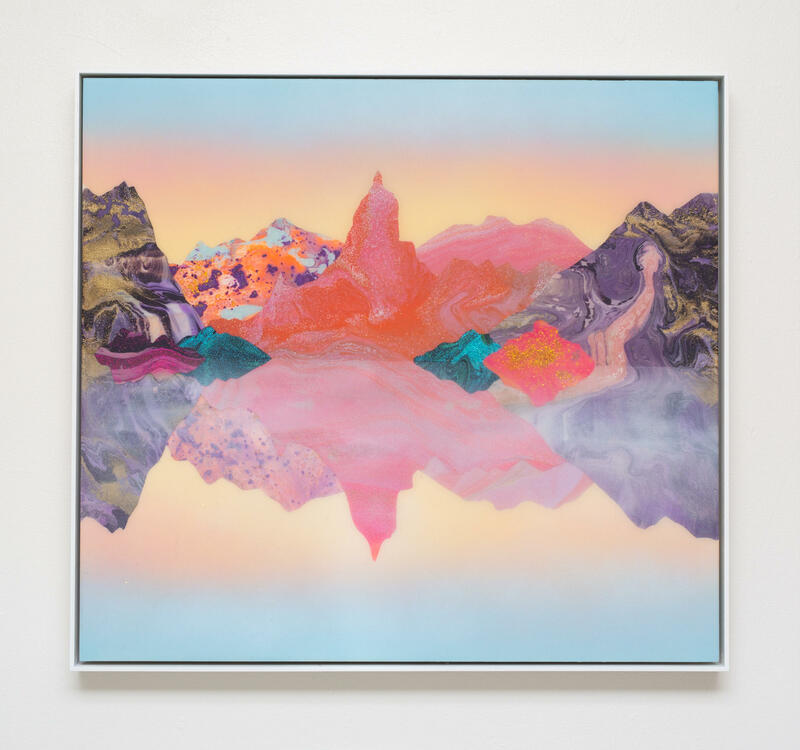 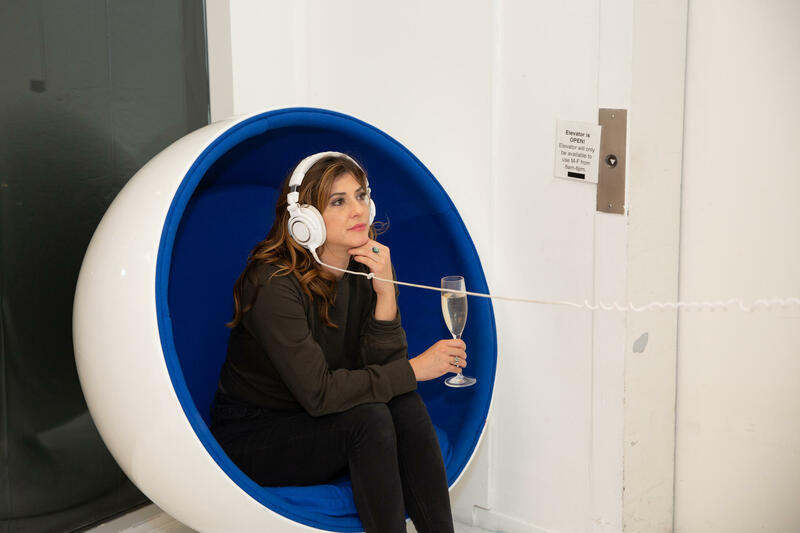 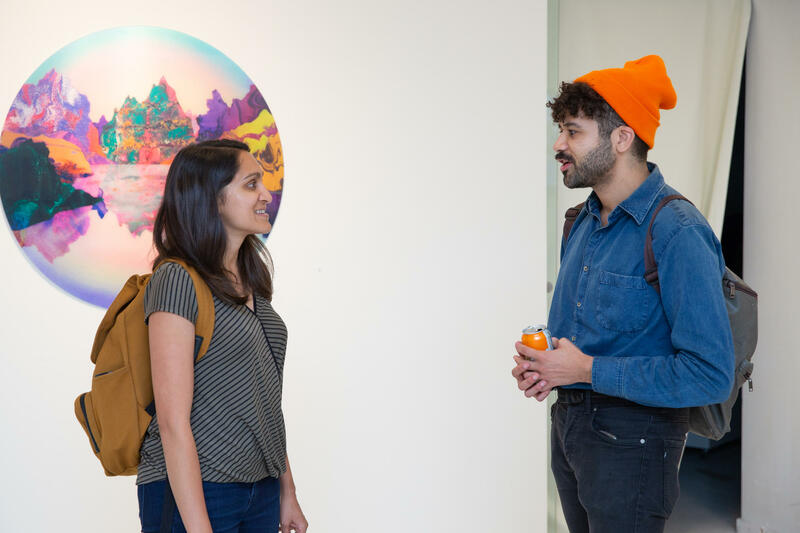 She has also been part of group exhibitions in Auckland, Berlin, Beijing, Indonesia, Los Angeles, London, New York, Paris, Reykjavik, San Francisco, Seoul, and Tokyo in both private galleries and public museums including MOCA Taipei and POSCO Seoul. 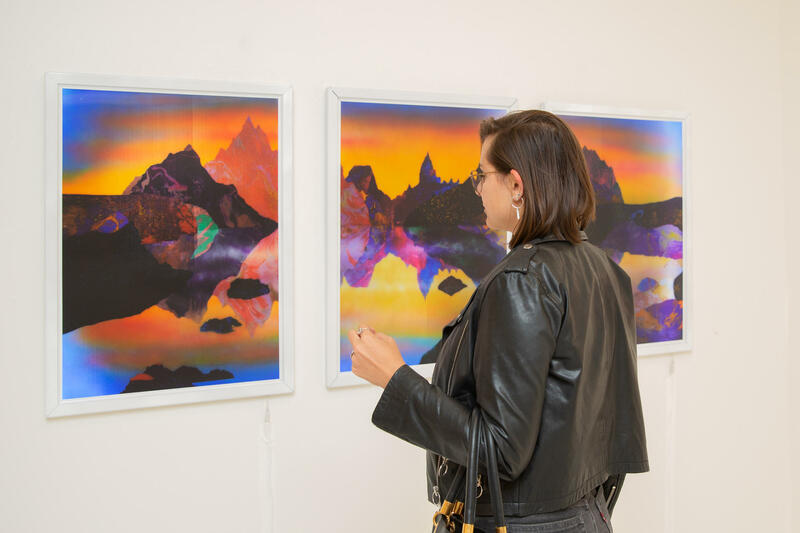 The recipient of numerous grants and residencies, including Australian Council 2015, Point B, New York and SIM, Iceland in 2013, Kate has also been shortlisted for over 30 prizes, including the Wynne Prize, the Prudential Eye Award 2015 and the Saatchi Gallery Prize, London, 2015. 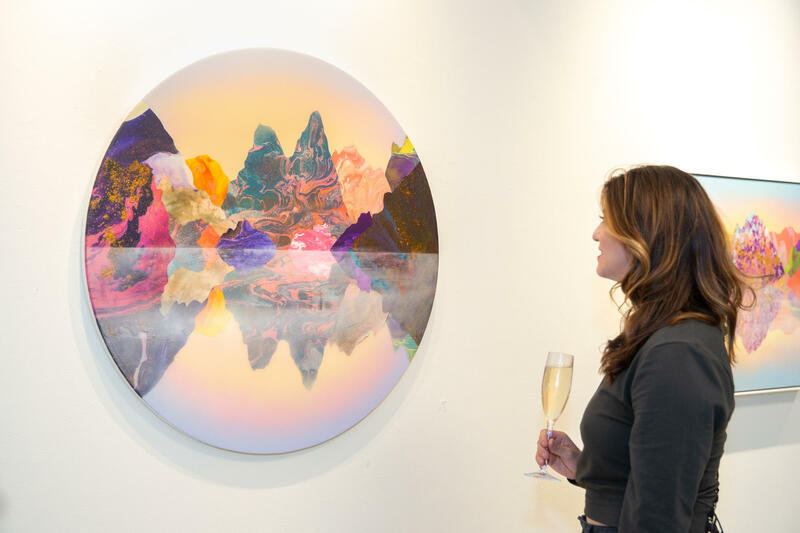 In 2018 she was the winner of the Tattersalls Club Prize and also won the Artists Wanted prize, Scope New York, in 2011.